Bloat is a medical condition in which the stomach becomes overstretched by excessive gas content. It is also referred to as torsion, gastric torsion and gastric dilatation-volvulus (GDV) when the stomach is also twisted. Bloat typically manifests through gastric distention, expansion of gas, fluid and/or food in the stomach and is usually the result of large hastily eaten meals, possibly followed with large amounts of water, and finally considerable amounts of exercise, usually within the first few hours after eating. Bloat is caused by rapid eating, eating dry food that contains acid as a preservative, eating dry foods that contain fat among the first 4 ingredients, the dilution of gastric juices necessary for complete digestion by drinking water before or after eating, eating foods such as kibble that expand in the stomach, overfeeding, drinking too much water quickly, exercise before and especially after eating, build and physical characteristics (dogs that have a deep and narrow chest). Additionally, bloat has been observed to be brought on during times of stress, during boarding, mating, change in routine, etc. Symptoms of bloat include, standing uncomfortably and seem to be in extreme discomfort for no apparent reason, firm distension of the abdomen, weakness, depression, difficulty breathing, excessive drooling, retching without vomiting, collapsing, hunched up appearance. Bloat is an emergency condition, having the animal examined by the vet is VERY important. Bloat can be fatal in a matter of minutes. In treatment, the veterinarian will attempt to decompress the stomach by passing a stomach tube. However, in many cases, surgery is needed to save the dog. An ounce of prevention is worth a pound of cure! To prevent bloat feed 2 or 3 smaller meals daily (as opposed to 1 large meal), any changes in the diet should be made gradually (over a period of at least a week), vigorous exercise, excitement and stress should be avoided from 1 hour before to 2 hours after meals, excessive drinking should avoided, feed a highly digestible food. Dog breeds known to be more susceptible to bloat are, Great Danes, Weimaraners, Saint Bernards, Gordon Setters and Irish Setters. My own personal note on the subject of bloat, while they aren’t listed as breeds at high risk for bloat I can’t see why all brachycephalic dogs aren’t considered to be at high risk (squishy faced dogs like bulldogs, pugs, boston terriers, etc). These dog breeds are known to inhale more air while eating which is what causes them to be so flatulent. That would indicate to me that they were more susceptible to bloat but I did not find that in anyof my research, this is just my theory. Great article Tessa!! Some of these I have never would have known to be cautious of. Thank you! Great article. We were looking into Great danes before we got Silva and I was told by 2 breeders that this is common in that breed. Good article Tessa! Hopefully I will never need that info but it is good to have in case. Very nice article...I am saving it to put in with my puppy packs. I just had a friend who lost 2 mastiffs in 3 months to this horrible condition....! Bump for everyone who hasn't read it or would like to take another look. It includes very simple and great tips on how to prevent bloat. I lost an akita to bloat. I wasn't sure what it was, but I had a bad feeling. I coundnt get her in to see her regular vet( not telling them i thought it might be bloat) the vet I did end up taking her to, waited 6 HOURS!!!! to do any kind of xray, apparentlly SHE didn't know what it was. By the time I got her into the emergancy vet (at 1am) the opened her up to do the surgery and came back to tell me to say my goodbyes, there was nothing they could do, it was too late. If you have even the SMALLEST feeling it might be bloat, dont wait and MAKE them see you!! !This was 15 tears ago and I still cry... I still blame myself. Oh I am so sorry to hear that, so sad! Don't blame yourself, SO many people don't about bloat! But remember it is good to share your story because it will inform others and may keep other pups from losing their lives so tragically. Bloat (twisted stomach) was the cause of death for Sherman, our first Bulldog. We got him to the vet. right away but Sherm was almost 9, taking heart meds., and our vet was sure Sherman wouldn't survive the surgery. oh my that is scary and so sad for those of you who have lost dogs to this condition. 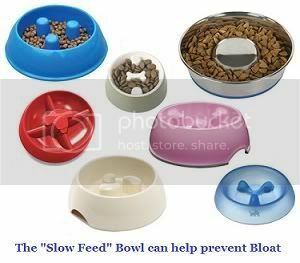 i was thinking of a slow feed bowl for sarah but now im going to go get one or that ball thing that you put in the bowl. would hate to lose sarah because of something that could simply be prevented. My Bobby just passed away of possible bloat, this was riduculous. I still can't believe that it could happen to my boy. He was just a year old. He ahad eye allergy and this might have been a stressfull situation for him, but to the point that they may die? How about a crate training it's a stress to , right? I don't know anymore. Everything can be considered a stress to them, and is this a reason of a bloat?